Are you over your tattoo? Is it time to make a change? Statistics indicate that 45 million Americans have tattoos, and 20% of those individuals live with regret about it. 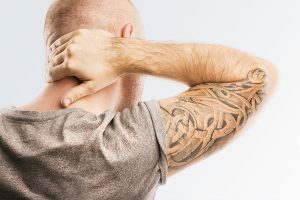 Whether you no longer like your tattoo or you have come to realize that its placement is holding you back from getting the kind of job you truly desire, our superior tattoo removal at MD TLC can help you. We proudly carry two of the most advanced tattoo removal lasers currently available. We are one of the few practices in the Wellesley area that carry the PicoSure laser, a leading advancement in the removal of tattoo ink in the skin, including previously hard-to-remove blue, red and black ink. Many of the patients that come to our office seeking tattoo removal feel apprehensive about the process. They have heard that it is painful and extremely lengthy and while that was the case with older technologies, it isn’t the case with our state-of-the-art lasers. PicoSure works by delivering short pulse duration picosecond laser to the skin, breaking up the ink particles which are then eliminated by the body. The process isn’t particularly painful; many patients compare it to the feeling of getting a tattoo. Additionally, each treatment is relatively quick and while subsequent treatments are needed, most removal treatments with PicoSure are complete after 4 to 8 treatments. This tattoo removal device offers a large spectrum of laser wavelengths for removing any colors in a tattoo. Using the Q-Switched laser method, the Revlite rapid-firing laser removes ink without harming the surrounding skin. Multiple treatments are typically required. Don’t live with tattoo regret any longer! Our tattoo removal process here at MD TLC is effective, well-tolerated and safe for most skin types. Interested in learning more about Tattoo Removal?